Wanna Plan A Fun And Worry-Free Event? "We schedule our events several months ahead to ensure they are in the hands of the skilled and fun-loving staff of Auntie Roxie’s Life of the Party!!". Bring the BARN to YOUR EVENT!! BIG CITY KIDS LOVE RIDING AN ACTUAL PONY! One pony, many ponies, pony sweep, or even a horse-drawn carriage ride! or… THE KIDS GET TO PLAY WITH FARM ANIMALS! Our handlers will help guide the children on their prairie adventure. 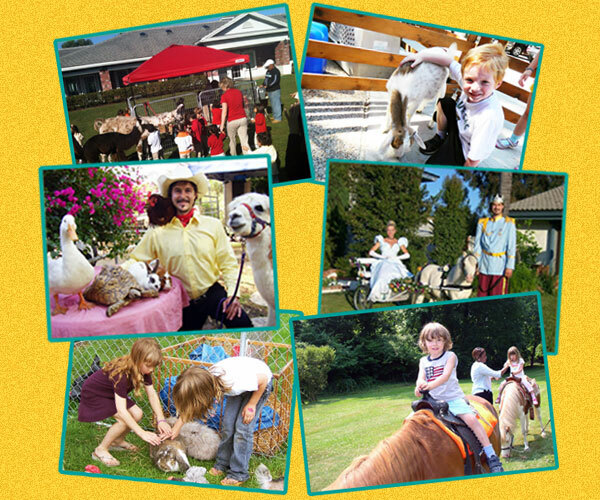 Pony Ride & Petting Zoo Combo Packages are also available!